Asfordby Amateurs Gems opened their home account in the Leicestershire FA Girls Under 10s League on Sunday with a local derby against Bottesford Girls. The Asfordby girls made a positive start and didn’t have to wait long before a low drilled effort from E. Sutcliffe found the net. M. Tinsley quickly added another after a mazy run saw her fend off four Bottesford players and place a precise strike into the far bottom corner. Unrelenting running and tackling from D. Ferreira De Oliveira and E. Baker in midfield ensured Bottesford were kept at bay for long periods. It took a couple of superb individual efforts to beat goalkeeper M. Paterson. After the half-time break, striker E. Curtis’ determination paid off, after accurately judging a long bouncing goalkick from Paterson to break clear and strike home a thunderous left-footed effort. Darting runs and clever passes from R. Price and C. Plimmer quickly saw Curtis bag another after the Asfordby girls linked well. I. Fletcher commanding the back line, numerous brave saves from Paterson and a courageous home debut by A. Perks ensured Bottesford’s quick counter-attacks didn’t punish Asfordby too much. 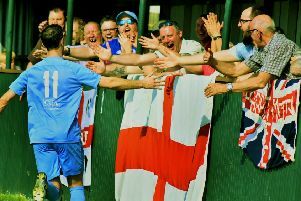 It wasn’t long again before the confident Curtis secured her hat-trick, battling hard to win the ball from a defender before firing past the Bottesford keeper, much to the delight of the home fans. The Asfordby girls put in a superb team performance which left coach/manager Leah Radford very proud and excited that all the hard work put in at training is starting to pay off. * Asfordby Amateurs Girls welcome new players of all ages and abilities. The girls train from 6pm to 7pm on Wednesday evenings at Hoby Road, Asfordby. * Asfordby Amateurs Girls Under 12s travelled to Leicester Ladies for the first round of the County Cup. They gave first team starts to Millie Goulding and Lauryn Aldridge who also captained the team for the first time. Asfordby have become well known for starting strongly and did not disappoint when top scorer Hope Metcalf struck with only a minute on the clock. The visitors then had to cope with plenty of Leicester pressure and within 10 minutes Leicester were level. On 20 minutes Asfordby caught Leicester out with their pace on the break. And from Ruby Attewell’s great ball into the box, Sophie Townsend found herself unmarked to smash home into the roof of the net from close range and make it 2-1. After half-time, Amateurs made a number of changes as Alice O’Sullivan, Erin Baker, Lauren Farrow, Ruby Sarginson and Sophie Varley all come on. Leicester continued to push and scored three more goals to make it a 4-2 win to secure their passage through. Asfordby’s player-of-the-match was Millie Goulding who was excellent in breaking up Leicester’s attacks. They will now look to continue their unbeaten league record on Sunday away at Harborough Town. Asfordby: Leah S, Ella W, L. Aldridge (c), Evie M, H. Metcalf, A. O’Sullivan, M. Goulding, S. Varley, S. Townsend, R. Attewell, R. Sarginson, L. Farrow, E. Baker.